I am soooo excited to share todays collaboration with you guys! I am sure you all know the beautiful Megan from For All Things Lovely! I have followed her blog for a while and hands down it is one of my favorite daily reads! Megan's style is impeccable! She always looks flawless and effortless! 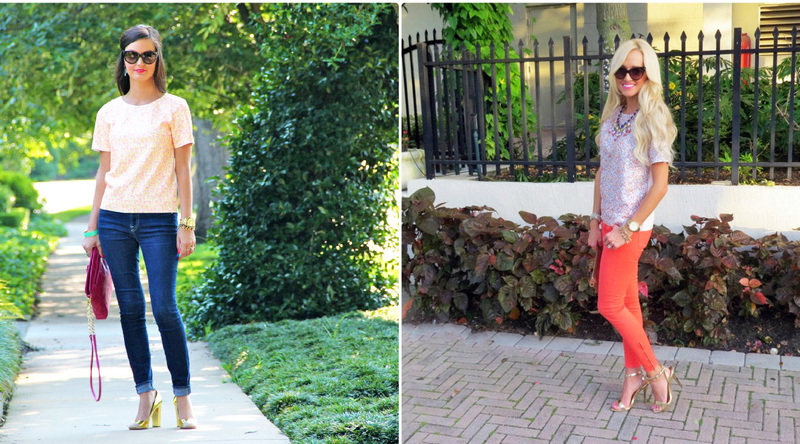 Today we wanted to show two different way to style this J.Crew sequin top! Megan got it in pink and I got it in blue! Sequins are a definite way to add a little extra sparkle to any outfit! This top is one of my new favorites and I am sure it will be on heavy rotation! Don't forget to check out Megan's Blog if you haven't already! I am sure you will love it as much as I do! That sequin top is gorgeous and so on my wish list! SO gorgeous!! I love this sequin top with those pants. I really adolre your style!! I love the sequins Jade and your coral pants are so bright and fun! So pretty! I had been on the fence about purchasing this necklace and I think you just tipped me to purchase!